Kurtley Beale is named at fullback for the Waratahs in place of the suspended Israel Folau. NZ-born England star Denny Solomona explains why he chooses to steer clear of all the negativity on social media. Aussie tennis legend says her heart goes out to rugby star over his public "persecution" for anti-gay social media posts. Highlanders coach Aaron Mauger cools talk of an All Blacks callup for young first-five who's "learning his trade". His star brother's injury is a huge blow for the Chiefs, but Marty McKenzie is hoping to continue some best-ever form. 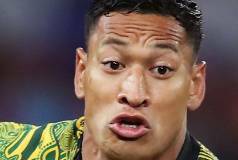 After breaking former All Black's record, Israel Folau has plunged his career towards an ignominious end. OPINION: The loss of the Chiefs' fullback is far bigger blow than has been acknowledged. OPINION: Attempt to sack the controversial star is fraught with difficulty, a former Supreme Court judge says. 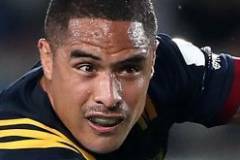 Auckland-born England rugby star Denny Solomona explains why he steers clear of all the negativity online. 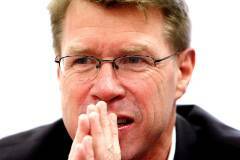 NZR chairman bemoans the lack of diverse options for new board members put forward by the provinces. Rugby's governing body happy with financial result, which was 44 per cent ahead of budget, but a dark cloud is approaching. The fullback has hired star lawyer Ramy Qutami to prepare for his legal showdown. Northern unions give hope to radical Nations Championship by seeking more crucial details ahead of May vote. Hurricanes opt to leave out key All Blacks trio for Friday's match in Tokyo. 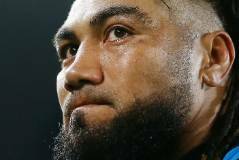 As if losing Damian McKenzie wasn't bad enough, the Chiefs will be without two other All Blacks against the Lions on Friday.